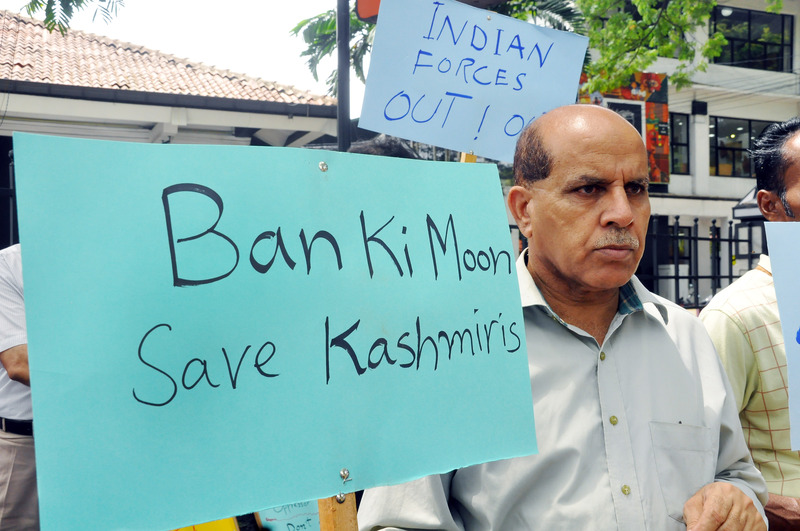 July 21 (NIA) – Over a 100 people gathered outside the UN building in the Sri Lankan capital Colombo on Thursday, demanding a UN probe to alleged human rights violation committed by Indian forces in Indian controlled Kashmir. The protesters expressed grave concern over the ongoing violence and killings in Kashmir and alleged that atleast 50 civilians had been killed since July 8. The protesters further alleged that over 3500 civilians, most of them who had lost their eye sight due to pellet guns being used, had also been injured in the ongoing battle between militants and Indian security forces. The protestors urged the UN Secretary General to encourage, facilitate and support efforts leading to a peaceful resolution of the Kashmir issue in accordance with the UN Security Council resolutions to ensure resolution of this longstanding unresolved issues. A memorandum with thousands of signatures urging the UN to play its role to resolve the Kashmir issue was also handed over to the UN office. A curfew remained in tact for the 13th day in Indian controlled Kahmir on Thursday in order to prevent the escalation of violence between militant groups and Indian security forces. Violence broke out on July 9, after Hizb-u-Mujahideen commander, Burhan Wani was killed in a gun battle by the Indian army. Media reports said that since then 45 people, including 43 civilians and two local policemen have been killed in violent clashes.